President Jokowi has a dialog with King Salman at Riyadh Palace, Saudi Arabia, Sunday (14/4). (Photo by: BPMI). 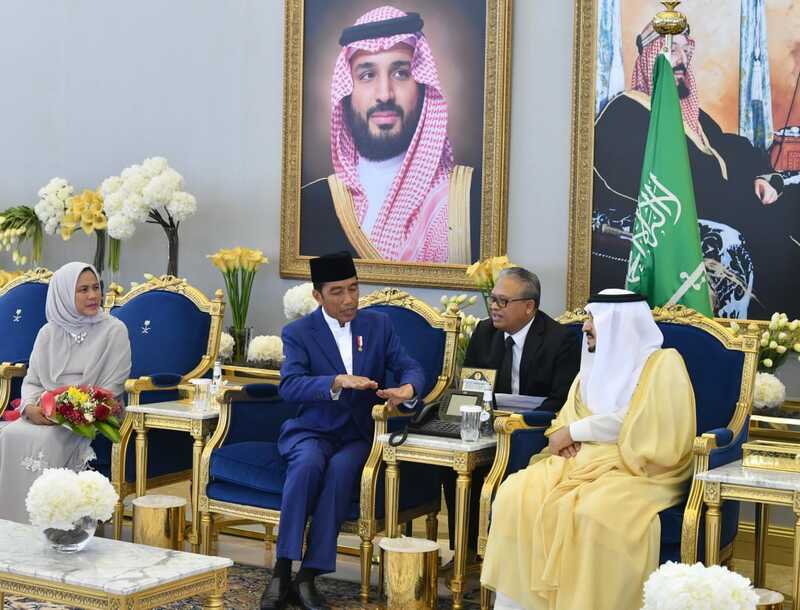 President Joko “Jokowi” Widodo on Sunday (14/4) began his official trip to Riyadh, Saudi Arabia. The President and his entourage arrived at King Khalid International Airport, Riyadh, Saudi Arabia at 08.50 (Saudi Arabia Local Time) or 12:50 WIB (Western Indonesia Local Time) and were welcomed by the Indonesian Ambassador to the Kingdom of Saudi Arabia Agus Maftuh Abegebriel, Governor of Riyadh Prince Faisal bin Bandar Al Saud, and Minister of Trade and Investment Majid Bin Abdullah Al Qasabi.